PRINCE GEORGE, BC: Each winter, approximately 15,000 to 20,000 tonnes of sand and fractured rock is deposited on Prince George’s streets and sidewalks by City crews to improve safety and traction on icy surfaces. In the spring, all of that sand and material can become dust and negatively affect air quality. Consequently, about 550km of paved roadway, 150km of sidewalk, and over 24 square km of medians must be swept and flushed each spring by City staff. City staff commence sweeping operations as soon as conditions permit. Sweeping operations begin when the main roads are clear of ice and when temperatures are consistently above zero. Since spring snow melt occurs at a faster rate in the bowl area than outlying areas at higher elevation, major arterial and collector roads in the bowl receive the first stage of sweeping operations. Sweeping usually begins in early to mid-April. Currently, crews are flushing sidewalks and medians. Sweeping operations should begin on-schedule in April and take several weeks to complete depending upon factors including weather and the availability of resources. 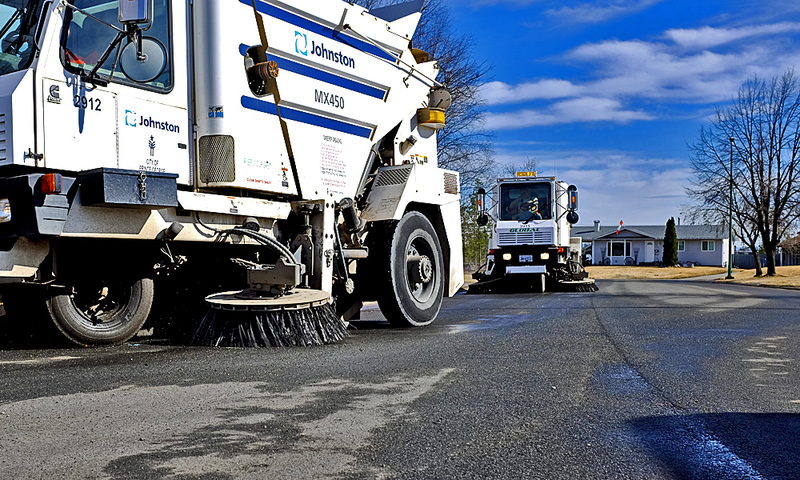 Once sweeping operations are complete, downtown streets will be swept regularly and maintenance sweeping and flushing will occur as required around the City through the fall. The sand, fractured rock, and other materials that are swept up are stockpiled by the City and then later hauled to the Foothills Landfill to be used as covering in the operation of that facility. After the City roads, medians, and streets have been swept and flushed, contracted crews can begin line painting provided the conditions are right. Line painting and painting of traffic control markings begins when the temperature of the asphalt is 10 degrees Celsius and above in order for the paint to best adhere to the pavement. The amount of rain the City receives is also a factor. The painting of road lines and traffic control markings are completed by contractors with the aim of having all of the work done by early summer. However, if a section of road is scheduled to be repaved later in the year, the City may opt not to repaint the lines and markings until that work is completed. After the City roads, medians, and streets have been swept and flushed, contracted crews can begin line painting provided the conditions are right. Line painting and painting of traffic control markings begins when the temperature of the asphalt is 10 deg Celsius and above in order for the paint to best adhere to the pavement. The amount of rain the City receives is also a factor. The painting of road lines and traffic control markings are completed by contractors with the aim of having all of the work done by early summer. However, if a section of road is scheduled to be repaved later in the year, the City may opt not to repaint the lines and markings until that work is completed. In 2009, Environment Canada began to restrict certain volatile organic compounds (VOCs) that were effective in roadway paint last longer. Road authorities across Canada must comply with the VOC limitations in roadway paint. The City has not yet identified a roadway paint product that performs as well and is capable of lasting multiple years as those which have a higher VOC content. Written and released by City of Prince George.